in global warming. Author's opinion. "As evangelical scientists and academics, we understand climate change is real and action is urgently needed. All of God's Creation - humans and our environment - is groaning under the weight of our uncontrolled use of fossil fuels, bringing on a warming planet, melting ice, and rising seas. The negative consequences and burdens of a changing climate will fall disproportionately on those whom Jesus called "the least of these": the poor, vulnerable, and oppressed. Our nation has entrusted you with political power; we plead with you to lead on this issue and enact policies this year that will protect our climate and help us all to be better stewards of Creation. Average global temperatures are at their highest level within the measurement record, and we are beginning to see indications of increasingly disturbed weather. For example, 2012 was the hottest year ever recorded for the contiguous United States, and it will go down as one of the most destructive and disruptive years in U.S. history: wildfires, drought, superstorms, and public health outbreaks. This past year is only one example of the patterns of change we expect to see as the climate warms globally. We're already spending billions in emergency aid for the victims of hurricanes and weather disasters, and these expenses will only increase as the "once in a lifetime" storms become the new normal. We appear to be nearing the end of one of these constant-temperature segments to the "staircase." They are aware of the staircase phenomenon, in which case they can be ignored because they are being deceitful. End of the webmaster's opinion. As of 2014-MAR, we appear to be nearing the end of an interval of relatively constant temperature and can expect a rapid increase in the near future. Volcanoes are known to release tiny particles of sulphur high into the atmosphere. They reflect sunlight, prevent the sun's rays from warming the ground as much, and cause the Earth's surface temperatures to drop, stay the same, or increase more slowly. An unexpected, massive volcanic eruption -- the largest in the 20th century -- occurred in 1991. Mount Pinatubo exploded in the Cabusilan Mountain range on the Philippine island of Luzon. It ejected millions of tons of ash and gas into the atmosphere, reaching an altitude of 21 miles. The average world temperatures dropped an average of 0.5 degrees C (0.9 degrees F) over the next two years. 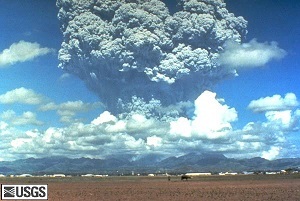 Seventeen smaller eruptions occurred between the year 2000 and 2009. "Volcanoes give us only a temporary respite from the relentless warming pressure of continued increases in CO2."